Summer is the time for cookouts, picnics, and watermelon. If you’re like me, you can’t wait to break open the first watermelon of the season. Sometimes your rush ends up in disappointment because the watermelon you’ve chosen just isn’t tasty, which means it just isn’t ripe. Let’s discuss how to tell if a watermelon is ripe so when you crack it open, it tastes like summer. The trick to finding a ripe watermelon is to go beyond its appearance. Unlike some fruit, you can’t rely on your sense of sight to determine if you’re about to buy a nice, ripe, juicy watermelon. Take a banana, for instance. If the peel is yellow, chances are it’s ripe. With a watermelon you also have to call on your sense of sound and your sense of smell. Watermelons, no matter what variety – small round or large football shaped – have a particular sound when you knock on them. A ripe watermelon will give you a “thud” sound when you knock on it with your knuckles. Hold the watermelon close to your ear by cradling it in one arm, then knock on it with your opposite hand; like you’re knocking on a door. You should hear a dull sound, not a high ringing sound. Do this to several watermelons until you get the sound that doesn’t resonate a lot; it sort of disappears into the watermelon. This may not make any sense until you actually thump a few! 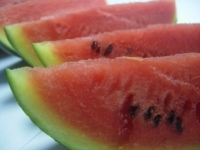 The watermelon scent is very distinctive and is another clue to a ripe watermelon. Once you’ve chosen a watermelon with the right sound, you need to use your sense of smell to finalize the deal. Take your watermelon and walk away from the bin so your nose isn’t confused by too much watermelon scent. Get your nose close to the watermelon end and sniff. You should get a delicious watermelon scent. If your nose is still confused by all the watermelon aromas, walk over to the coffee aisle and do the old wine tasting trick. Clear your nostrils with a whiff of coffee scent. Wait a minute, then sniff your watermelon.